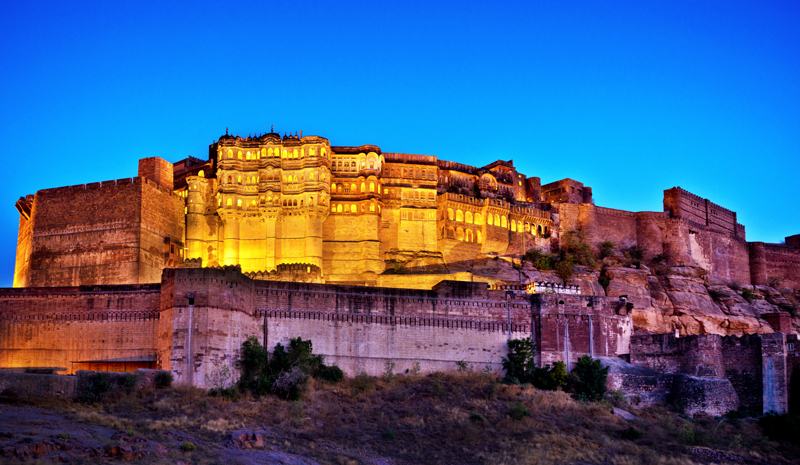 Rajasthan is one of India’s most popular tourist destinations, and it isn’t hard to see why. 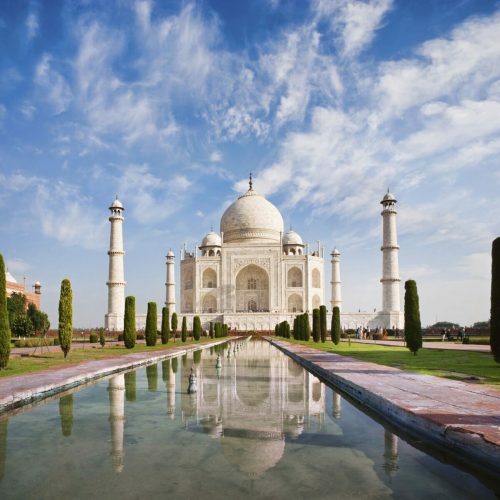 The Land of Kings is bursting with lavish palaces, colossal forts, historic temples and other iconic sites. For first-time visitors (or repeat travellers who want to relive its charms), we’ve compiled a list of 10 quintessential Rajasthan landmarks to see during your next Indian getaway. Arguably the most iconic landmark in Rajasthan, the Mehrangarh Fort is a sprawling monolith that stands 120 metres above the blue-painted buildings of Jodhpur. Venture within the huge complex, and you’ll also discover a museum, courtyards, gardens, bazaars, and people from all walks of life. 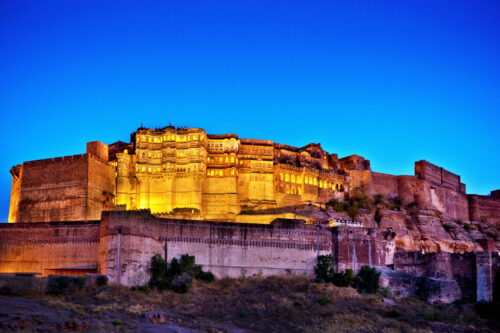 Located on the outskirts of Jaipur, the Amber Fort (also known as the Amer Fort) is a landmark of phenomenal beauty. Perched on a hilltop and constructed from distinctive red sandstone, it can be admired from miles around. And for visitors looking to get up close, its beautifully preserved interiors also beg to be explored. 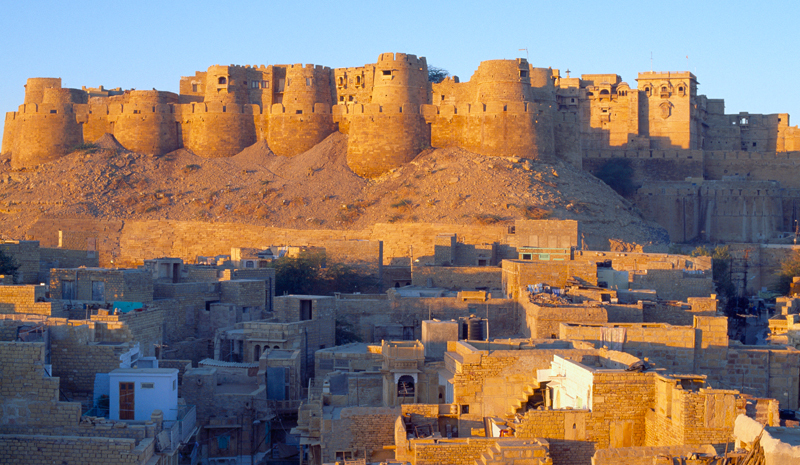 Another of Rajasthan’s impressive forts, the Jaisalmer Fort (along with the Amber Fort, Chittorgarh Fort, and four others) is part of the Hill Forts of Rajasthan UNESCO World Heritage Site. Built in the 12th century, and still beautifully preserved, it overlooks the golden sands of the Thar Desert. In the 18th century, Rajput king Sawai Jai Singh must have nurtured a great curiosity about the night sky. After all, he oversaw the construction of the Jantar Mantar in Jaipur. A fascinating celestial landmark, it comprises 19 astronomical instruments — including the world’s largest stone sundial — and remains a monument to the spirit of discovery. 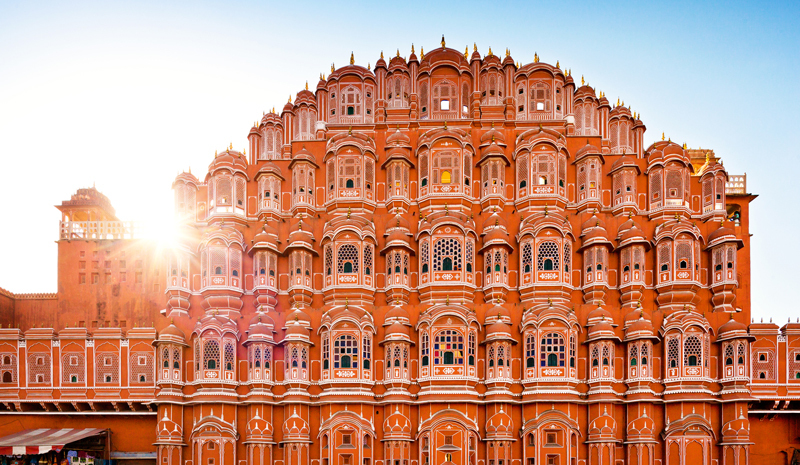 Its evocative façade (terra cotta in hue, covered with ornamental carvings, and soaring five storeys into the air) has helped make the Hawa Mahal palace an icon of Rajasthan architecture. Built to house women from the royal household, its perforated front allowed them to observe the street below — without being admired themselves. The UNESCO-certified Chittorgarh Fort is one of the largest forts in all of India. 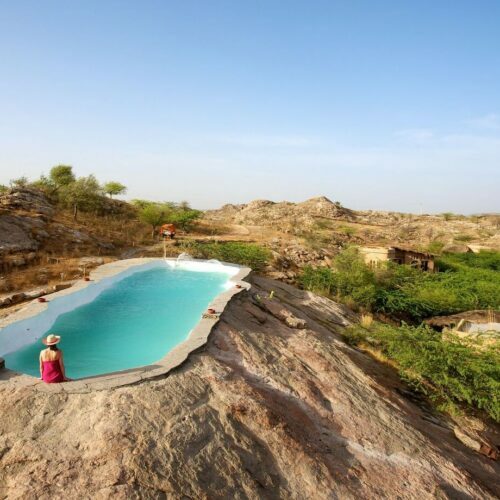 Occupying 700 acres, the hilltop landmark lies near Rajasthan’s eastern border. 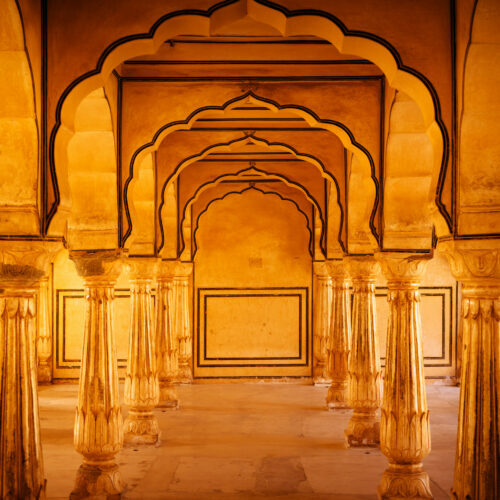 The beautiful example of Rajput architecture is also famous for its many pools, ponds, and bodies of water, and is surrounded by verdant scenery. 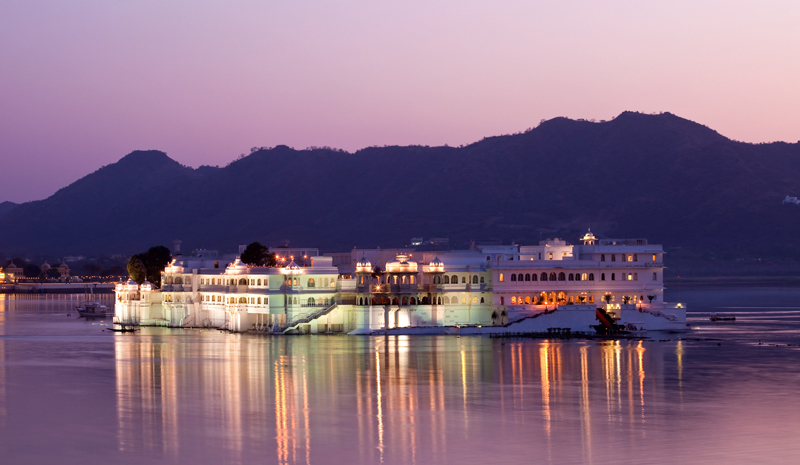 One of the crown jewels of Rajasthan, Udaipur’s Lake Palace is a glowing vision in white marble, located on a private island in the middle of Lake Pichola. Built as a pleasure retreat for a local Maharana in the 18th century, it is now a luxurious Taj Hotel. Book a stay for the chance to really soak up its charms. Located in between Udaipur and Jodhpur, the small village of Ranakpur draws flocks of visitors eager to discover its famous Jain temple. Built beginning in the 15th century — a divine vision supposedly inspired its creation — the temple has more than 1,400 carved marble pillars, of which no two are identical. 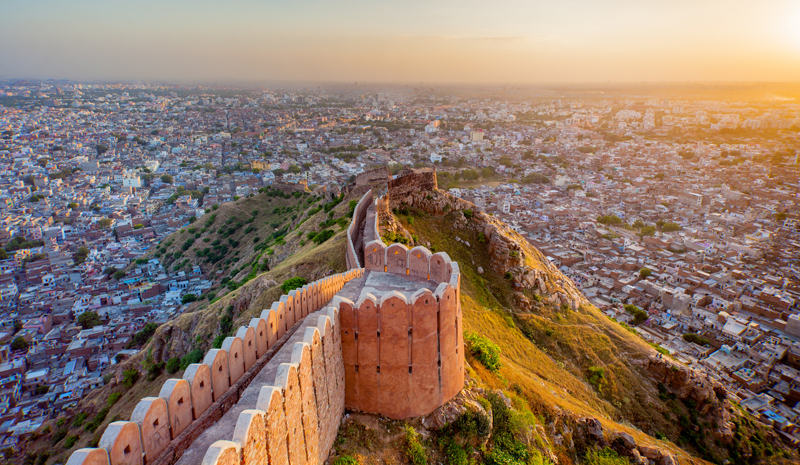 Fringed by the Aravalli Hills and near to Ranthambhore National Park, Jaipur’s Nahargarh Fort is yet another must-see in the landmark-filled Pink City. Built in the 18th century, it offers up glorious views overlooking the city as a reward to travellers who make the climb. A truly stunning landmark, the waterfront City Palace in Udaipur is the city’s most-visited site, and one of the region’s largest and most impressive palaces. Constructed over the course of several hundred years, its intriguing blend of styles makes it an architectural curiosity. Within the City Palace complex, you’ll find 11 individual palaces: enough to fill days of exploring.